LAST UPDATE: Monsoon has withdrawn from the country as an anti-cyclone has formed over central Punjab and adjoining areas of Pakistan and India as of September 19 as dry weather is expected to prevail till many days. Post-monsoon activity was observed over south-eastern Sindh however it was not significant. There are slight chances of a weak post-monsoon activity in south-eastern Sindh during this weekend. Islamabad got 405 mm rainfall from September 1 till September 18. Lahore got 235 mm rainfall from September 1 till September 18. Karachi got 120 mm rainfall from September 5 till September 15. Hyderabad got 110 mm rainfall from September 5 till September 15. Western disturbance ’21’ is over extreme northern areas now, it has become unimportant. Significant rainfall recorded in northern areas! A western disturbance ’21’ is over northern Pakistan and adjoining area. Eastern winds over the country are weakening. Lower Dir got 33 mm. Monsoon weakening – Westerlies taking over the country! A fresh western disturbance ’21’ is over northern Pakistan and adjoining area. Eastern winds over the country are weakening. Pak Pattan got 45 mm. Rawalpindi and Jhelum got 14 mm. Monsoon spell ends in Sindh with destruction! Fresh monsoon activity in the North! A fresh western disturbance ’21’ is moving towards the northern parts of the country, it would reach by September 14 night/September 15. Upper air cyclonic circulation over Sindh and adjoining area persists, it continues to attract moisture from the low pressure over north-western Madya Pradesh that has now also weakened into an upper air cyclonic circulation. Western disturbance ’20’ is moving eastwards. Monsoon spell coming to North Punjab! Yesterday’s low pressure has weakened into an upper air cyclonic circulation as expected, with that the overall rainfall coverage over the lower parts of the country has reduced significantly. A low pressure is over north Madya Pradesh and adjoining parts of India. A fresh monsoon spell is likely in the northern area after few days, it would be the eleven spell in that parts hence PWP upgrades the chance of 11th spell in northern areas to ‘high’. Monsoon is withdrawing from the country during the third week of September. Western disturbance ’20’ is over northern areas. Rahim Yar Khan got 59 mm. Low pressure over eastern India! New spell coming to North Punjab! Low pressure is over Sindh, it is moving westwards/WNW and weakening gradually. Western disturbance ’20’ is over northern Pakistan. A fresh low pressure area has formed over eastern India. Monsoon would withdraw during the third week of September. D.G Khan got 80 mm. Monsoon activity weakening over the country – Rains ending in south Punjab! 39 dead – Death toll reaches 69 during this spell! Low pressure over south-west Rajasthan and adjoining Sindh has absorbed the UAC in the Arabian sea, thus it is now situated over Gujarat coast and adjoining south-eastern Sindh, a rapid change in track, it would move westward into lower eastern Balochistan from Sindh and dissipate. Chances of more heavy rainfall in south-eastern and adjoining coastal Sindh including Karachi till 36 hours. Rain intensity over South Punjab has weakened to some extent. Western disturbance ’20’ is over northern Pakistan persists, it is attracting moisture towards northern areas. Rahim Yar Khan got 123 mm. Day 4: Rain continues in Karachi – Chances of more rain in Sindh! Low pressure over south-west Rajasthan and north-eastern Sindh and adjoining south Punjab. Low pressure over northern Arabian sea and adjoining Gujarat and Sindh has moved westward, it has weakened into an UAC. The low pressure over Rajasthan could merge with it in 24 to 36 hours, that could result in rains to continue with gaps till next week in Sindh including Karachi. Western disturbance ’20’ is over northern Pakistan, it is attracting moisture from both the lows towards to the northern areas. 30 deaths during since last few days! Day 3: More heavy showers lashed Karachi during the morning – more rainfall expected! Low pressure over west Madya Pradesh and adjoining eastern Rajasthan has moved westward in the last 24 hours and it is now situated over south-west Rajasthan and adjoining south Punjab and upper Sindh, it would move westwards/WNW. Low pressure over northern Arabian sea and adjoining Gujarat and Sindh has moved westward, it has weakened. Western disturbance ’20’ is over northern Pakistan, it is absorbing moisture from both the lows. More thunder/lightning with rainfall with chances (65% ) scattered heavy downpour expected in the northern (mostly north-eastern parts) and central areas (south Punjab) with thunder/lightning as tenth and seventh spell respectively continues in these areas. More chances of rainfall with thunder/lightning at times isolated (55%) heavy rainfall expected in Sindh including Karachi till week end. Local flooding: Heavy showers continue in the country – Likely to continue! Yesterday’s Well-marked low pressure area is over Madya Pradesh and adjoining area has weakened into a low pressure over west Madya Pradesh and adjoining eastern Rajasthan, it would move westwards/WNW. Upper air cyclonic circulation over northern Arabian sea and adjoining Gujarat and Sindh has gained a minimum intensity of a low pressure, it would move westward. Western disturbance ’20’ is over northern Pakistan, it is absorbing moisture from both the lows. Monsoon may start to withdraw during the third week of September. More thunder/lightning with rainfall with chances (65% ) scattered heavy downpour expected in the northern areas as the tenth spell would continue. Seventh spell has hit south Punjab as well, more thunder/lightning with rainfall with some chances of isolated heavy rainfall expected in the cities of South Punjab till this week. More chances of rainfall with thunder/lightning at times isolated (55%) heavy rainfall expected in Sindh including Karachi till this week. Interaction between western and eastern winds! Interaction between UAC and Low! 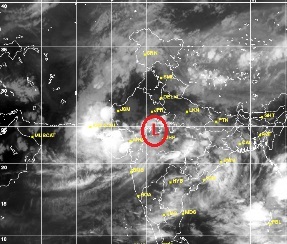 Well-marked low pressure area is over Madya Pradesh and adjoining area, it would move westwards/WNW. Upper air cyclonic circulation over Gujarat northern Arabian sea and adjoining Gujarat and Sindh persists, there is a slight possibility that it may intensify on September 6. Western disturbance ’20’is over the northern parts of the country. Monsoon may start to withdraw during the third week of September. Tenth spell continues in North! Heavy downpour is likely to cause local flooding in Punjab and Sindh! Yesterday’s low pressure area has further intensified into a well-marked low pressure area over Chhattisgarh, it would move westwards/WNW. Upper air cyclonic circulation over Gujarat northern Arabian sea and adjoining Gujarat and Sindh persists, there is a slight possibility that it may intensify. Western trough ’20’ has approached the northern parts of the country. Monsoon may start to withdraw during the third week of September. More thunder/lightning with rainfall with chances (65% – increased) scattered heavy downpour expected in the northern areas as the tenth spell would continue. Seventh spell has hit south Punjab as well, more thunder/lightning with rainfall with some chances of isolated heavy rainfall expected in the cities of South Punjab till this week. Western and Eastern Interaction over northern parts! Upper air cyclonic circulation over Gujarat northern Arabian sea and adjoining Gujarat and Sindh. Fresh Low pressure has formed in the Bay of Bengal and adjoining central-eastern coast, it would move westward Western trough ’20’ has approached the northern parts of the country. Monsoon may start from withdraw during the third week of September. Yesterday’s UAC over Gujarat and adjoining Sindh has moved into Arabian sea and adjoining Gujarat and Sindh. Fresh Low pressure would form in the Bay of Bengal during the coming week. Western trough ’20’ has approached the northern parts of the country. Monsoon may start from withdraw during the third week of September. Low pressure over west Madya Pradesh and adjoining east Rajasthan has rapidly weakened into an upper air cyclonic circulation. Yesterday’s UAC is now over Gujarat and adjoining Rajasthan and Sindh, it has weakened. Fresh Low pressure would form in the Bay of Bengal during the coming week. Monsoon is over so no rains.